The delivery method for Athens High School was construction management. The school itself is 284,874 SF and includes a freshman academy, two gymnasiums with three total competition courts, a media center, a cafeteria, a 840 person auditorium, and flexible space for future growth. Athens High School also features a 9,627 SF storm shelter that can hold 1,916 occupants, including all students, faculty and staff. The shelter will be opened to the public outside of school hours. A large, 52,000 SF courtyard area includes three outdoor classroom areas, seating for outdoor dining, a sculpture garden and circulation areas. 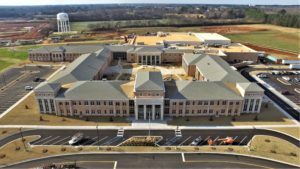 The school was substantially completed on January 15, 2019, one month prior to the contractual completion date. Students began class on January 24, 2019.